Toolkit is a powerful PDF generator and manipulator that can help you accomplish virtually any PDF-related task. 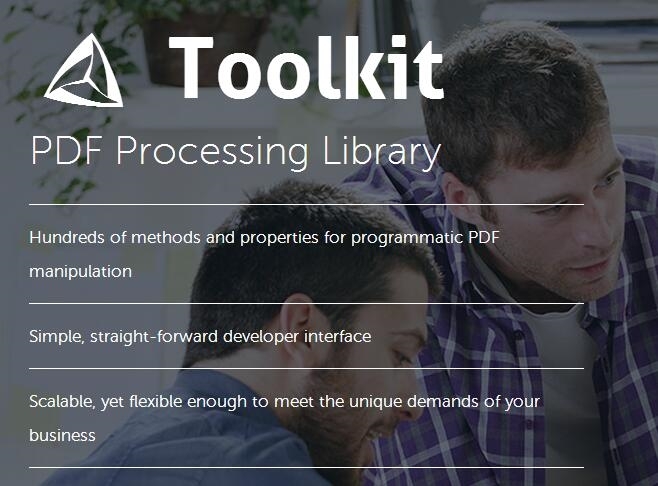 Offering a flexible .NET-native API, Toolkit is easy to deploy and manage, enabling you to get your PDF solution up and running in no time. 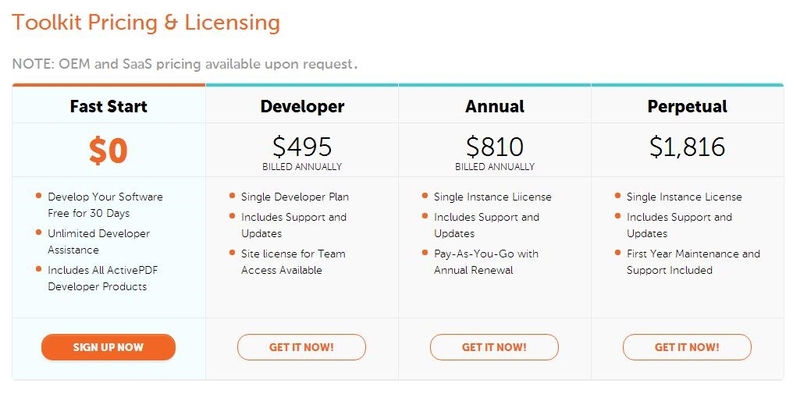 Unlike desktop PDF products, the server-side software affords you the control to centralize PDF settings support business standards and eliminate end-user intervention and per-user costs. 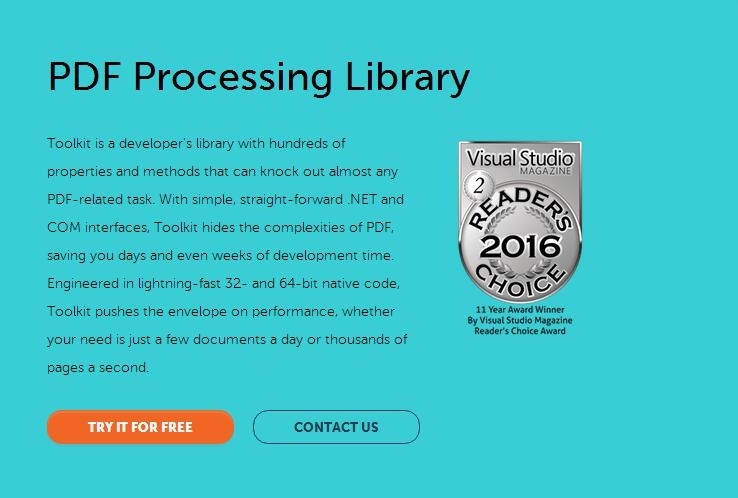 Offering a robust COM and .NET native API, activePDF provides an easy, affordable means to add file conversion functionality to all of your applications. Capable of converting commonly used file formats both to and from PDF, integration is as simple as a single method call. Toolkit's text width calculation routines make stamping and text placement within PDFs exact, allowing users to automatically apply standard text such as page numbers, headers and footers, or watermarks to a single page, range of pages or entire PDF documents, using any font available on a server, at any size or color, in any degree of rotation. Toolkit provides the ability to apply digital signatures to PDF files using certificates stored on a server. With Toolkit, end users can also create certificates on the fly, easily extending signing capabilities to every user in an organization. Painlessly utilize Toolkit to append or extract pages to and from virtually any PDF within seconds, even in memory. Toolkit's stitching technology allows you to import one or more PDF documents, combining them into a single PDF page. Previously labor-intensive applications, such as newsletters or classified advertisements, are simplified with this feature. Quickly combine, or merge, two or more PDF files with Toolkit. As an example, this feature could be used to combine multiple PDF reports into a single, navigable PDF file. Licensed per server, activePDF solutions help companies reduce per-user software and support costs by offering centralized PDF generation and PDF conversion functionalities, easily enabling users to seamlessly add PDF conversion to existing business applications. With Toolkit, PDF form filling can be accomplished interactively, by end users. Simply enter the desired information and click Submit. Data is seamlessly transferred to the designated area of your choice. Save locally to the form or to offline storage. In addition to interactive form filling, Toolkit can be used to programmatically fill form fields, allowing you to easily populate PDF forms and templates with text and images from any source. Toolkit Professional includes comprehensive image stamping with native support for over 40 image types, allowing for precise placement of logos, images, or electronically represented signatures within PDF files. Toolkit's Barcode object enables end users to generate over 100 barcode formats. Barcodes can be added to new or existing PDFs, or exported as XML, affording the flexibility to easily integrate with existing business processes. The latest product versions support Flash® file conversions, allowing you to add movies, animations, and sounds to your PDF presentation. 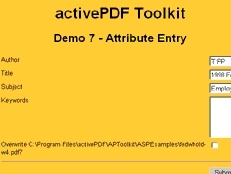 Toolkit lets users add or extract PDF annotations to any output PDF page or pages by simply defining the particular item at conversion. Toolkit includes options for creating bookmarks or hyperlinks within PDFs, making it the product of choice for assembling large, complex PDF documents. Attach any native file to a PDF. Archive original documents by attaching them to a PDF version for viewing without accessing original native files. Government agencies use Toolkit to gather web-based data, store as a SQL server database and generate PDF forms for ink signature. include populated data fields and attached scanned documents. 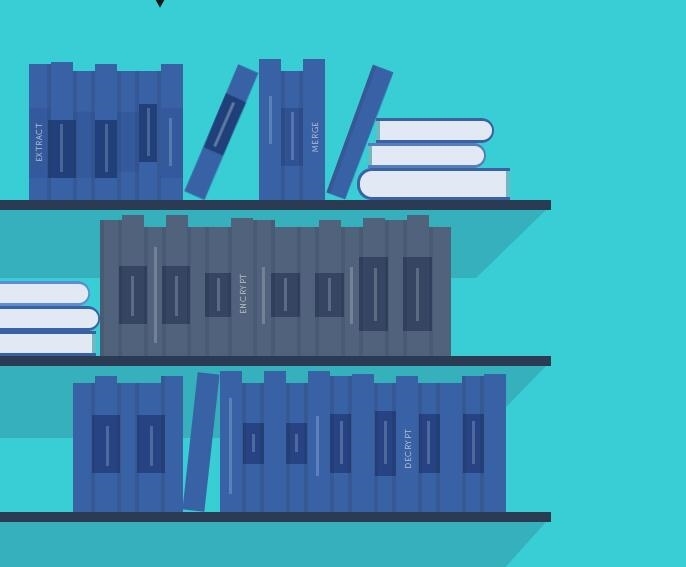 Publishers create customized books in PDF format based on user preferences. Accounting firms create populated tax forms as PDF that meet legal specifications and maintain document security. Toolkit will dynamically populate PDF forms from a database or extract data from user-completed forms. Merge multiple PDFs in a single PDF report, adding bookmarks for easy navigation. End users can authenticate PDFs electronically with digital signatures. Enhance paper-based document processing with automatic barcode generation, watermarks, encryption and much more. Customize PDF output by stamping client information or company logos on specified pages.